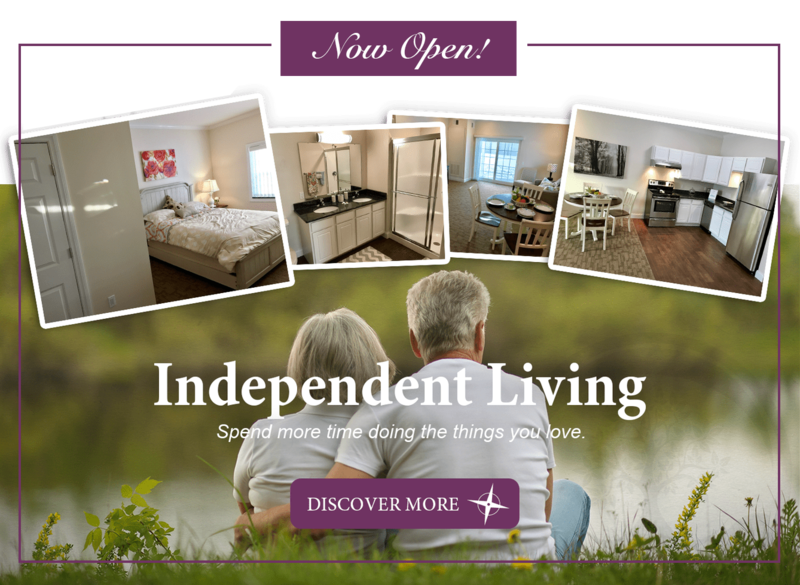 Our full-service independent living community gives retirees a lifestyle free from the worries of home maintenance in a beautiful secure setting. Spend more time doing the things you love, being with the people you love, and let us handle the rest. Enjoy a care-free life in a rich community where amenities are close and friends are even closer! • 3 spacious floor plans to choose from starting at 600 sq. ft.
• Many more à la carte amenities to choose from like restaurant style dining, housekeeping services, & local transportation. The Huron | 600 Sq. Ft. The Huron is a 600 sq. ft. one bedroom apartment with an open floor plan containing extra large living areas, spacious tile bathroom, and walk-in closet. Large bay windows bring the outside in and illuminate a beautiful kitchen which features deluxe granite counter-tops and stainless steel appliances. Optional courtyard setting with patio. Washer and dryer included. The Michigan | 700 Sq. Ft. This gorgeous one bedroom, one bathroom, 700 sq. ft. apartment sets the standard for luxury with 10’ high-ceilings, crown molding, high-end granite countertops, and tile master bathroom. Bedroom includes bay window and walk-in closet. Large living areas promote a comfortable lifestyle. The Michigan’s luxurious kitchen comes equipped with stainless steel appliances. Washer and dryer included. The Superior | 905 Sq. Ft.
Large bay windows allow daylight to pour into this extra large, two bedroom, 905 sq. ft. apartment. This spacious apartment comes with two full bathrooms, a master ensuite, and guest bath. Open floor plan provides a natural flow from it’s large living room into a beautiful kitchen adorned with exceptional amenities like granite counter tops, porcelain bathroom tiles and stainless steel appliances. Washer and dryer included.